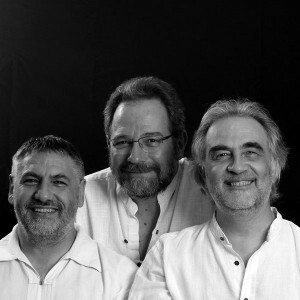 The Alzy Trio dates back to the spring of 2002 when three friends, all guitarists, decided to play some of their favourite jazz and bossa nova tunes. In 2007, they signed their first CD, Seize cordes en bal(l)ades. It included instrumental variations of eight great classics (Wave, Corcovado, So danço samba, Insensatez, So what, Birdland, etc.) composed by Miles Davis, Vinícius de Moraes, Tom Jobim and Joe Zawinul, among others. That first CD led to a television show with Pierre Barouh, Sheyla Costa and Jean-Pierre Mas, an invitation to the international jazz festival in Tangiers (Morocco) and an array of Friends concerts bringing together rafts of other musicians. 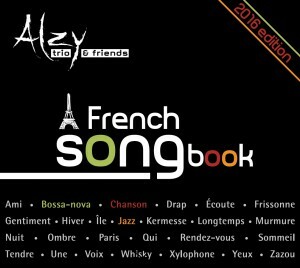 Today, together with a number of special guests, the Alzy Trio takes on the vast repertoire of French chansons with arrangements in a very jazzy and bossa nova style. They meander through time and styles with pleasure and a certain complicity that they hope listeners will enjoy.